This letter is dedicated to the toys that are strewn across the floor. The ones neatly stacked in piles or chucked inside toy boxes. The toys I am endlessly picking up, day in and day out. Toys, toys, toys galore. 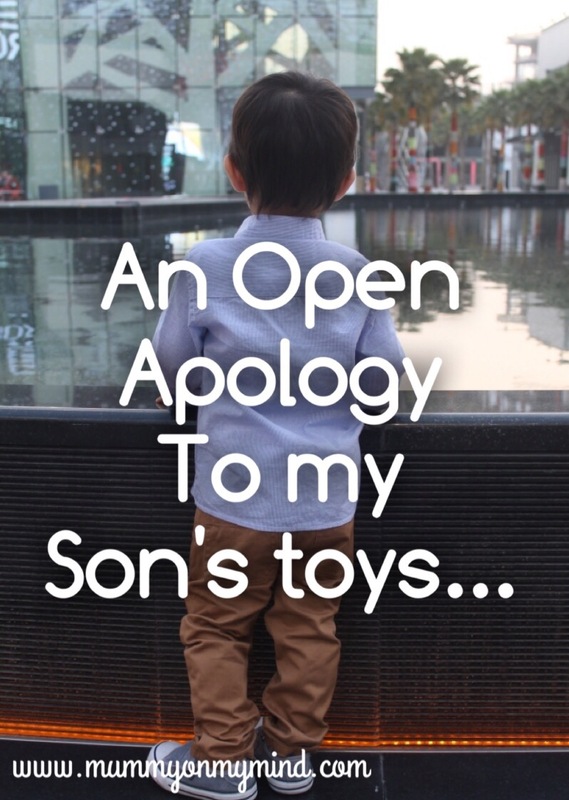 For being toys, you go through a lot, and well to be honest… I have a lot to apologise for. I am sorry for huffing and puffing as I pick you up after tripping up on you. For squeezing the life out of you and deforming you as my foot falls on top of you, or worse, I sit on you. For muttering under my breath, and leaving you be on the floor. I really don’t have the time for you right now. For kicking you out of my way when in a hurry. My son doth beckons. For shoving you under the sofa, before guests arrive. Out of sight, out of mind. And then forgetting you exist until weeks later when I am sweeping under the sofa to find you again. For throwing you away when Baby Z isn’t looking. Your noise is just driving me insane and you’re making my frown lines deeper by the day. For choosing one over the other to take with me in my handbag, it’s just that my son prefers the one with wheels. It’s nothing personal. For forgetting you exist sometimes, and rediscovering you after it’s too late and my son is too old to play with you. For hiding you away until later, for when my son is old enough to play with you. For punching you, in jest whilst we laugh manically. You are a punching bag after all, and it is easy entertainment for my son. For subjecting you to food splatters. My son insists to eat with you, and I can not deny it helps get food in him a lot easier that way. For drowning you in water. Baby Z seems to love taking you with him during Bubble Bath time, and boy don’t we all know you could do with a good old scrub. For pinching you, prodding you and plucking you, to hear that squeaky sound you make. For chucking you into your toy box at the end of the day, full of despise because I had told my son to do so, yet of course he ran away with some pathetic excuse. For selling you off, or worse- simply giving you away for free to others. Baby Z is just not interested in you anymore. For having thoughts about throwing you all out so as to dwell in my perfect adult and toy-free space. You are being rather selfish, don’t you think, taking over all the rooms in this house? I am sorry for all the things I put you through, on a daily basis, and why most of the time you seem to be more my foe than friend. Yet, even after all the torture I put you through, know this my dear ones. As long as my son demands, I will never stop Buying you. Acquiring you. Receiving you. You are forever around and our love-hate relationship will go on for years to come. Not just in my household, but also in my son’s and his children’s too, and so on and so forth. I just can’t get bloody rid of you. Do you have similar woes as me when it comes to toys? Feel free to share your thoughts (or apology) in the comments section below. Thanks! I think toys are used to all this abuse! But seriously, I find them in every corner of the house. Haha yes, they take over our homes and lives don’t they!! Ha ha! Such a cute post. And so timely too – I did a ‘spring cleaning’ of our toy cupboard just this morning. Haha thanks! These toys just get everywhere! Sooo cute. Imagine the world without toys. haha, yes, the world would be a very empty place, and living rooms would be sparkling clean! !